So you've bought a new gun and enjoy taking it out to the range. Your buddy bought one as well .In taking it out to the range, you and your buddy buy a couple of boxes of ammunition each and start pulling the trigger on those rounds. One hundred rounds or so apiece and that adds up in terms of money. As your shooting, there is a person down the line who was here long before you and as your packing up, he's still shooting. You walk over, introduce yourself and ask him how he can afford to shoot so much. He replies that he reloads his own ammunition. Reloads you think to yourself. Then you ask him what is involved. A press of some kind, dies for the caliber you wish to reload, a scale, a powder dispenser, and of course consumables, he tells you. Of course there's also some knowledge you have to acquire before you just start priming and charging cases. 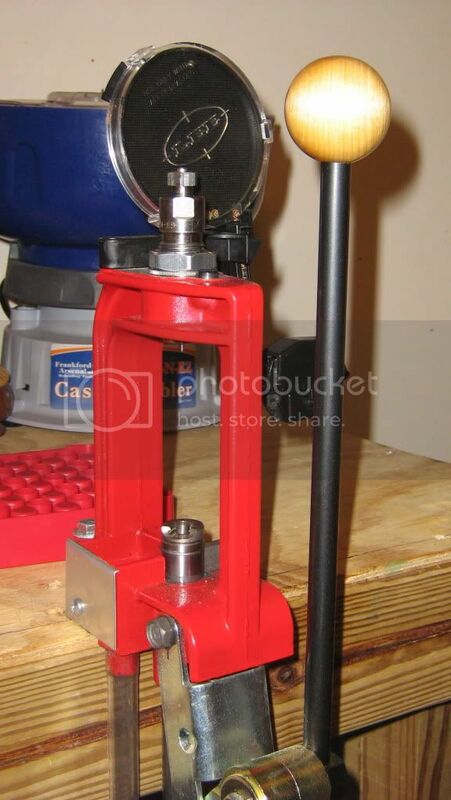 Welcome to a beginner's insight into reloading. I will attempt to explain how I reload using the knowledge I have gained since I started. If you have questions regarding your own reloading please use this as a starting point and seek experienced wisdom beyond what I can tell and show you. Speaking of knowledge, this book should be your first purchase if you have decided to start reloading your own ammunition. Go ahead and read it, I'll wait. Now, read it again, and..... yet again. There is a lot of knowledge in this book that is going to go a long way in helping you reload. That knowledge will help you from making dumb mistakes that can cause loss of a gun, a limb, your eye sight, even a life. 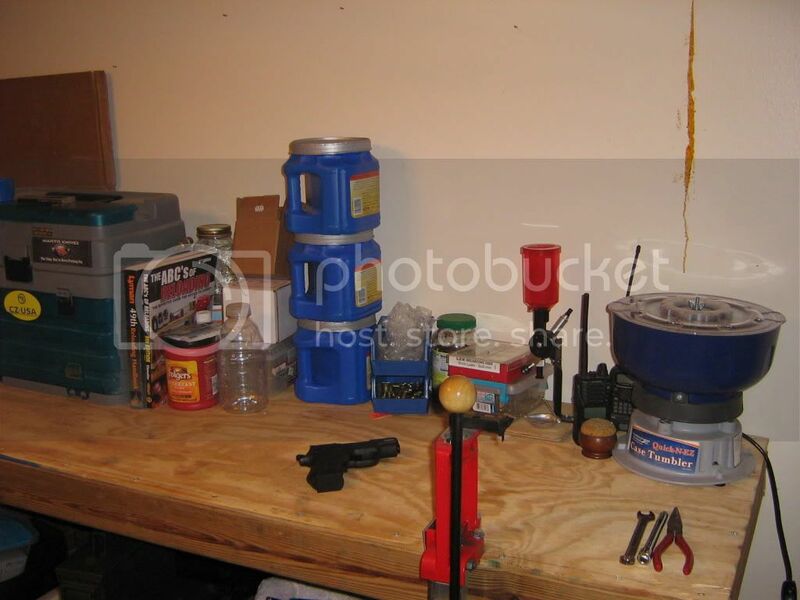 A note here, reloading means you're working with explosive primers and gunpowder. I cannot emphasize this enough, YOU CANNOT BE TOO CAREFUL. Ok, good, I hope I've stressed how important being cognizant of what you're working with is. I'd suggest you buy your book from the local gun shop. Find the person who reloads there and befriend them. They want to help you. If you do like I did, and buy a book here, a die set there, etc. you will become known to them. I visit my store at least once a week. The first after you've assembled your equipment and consumables is to deprime your cases. I accomplish this with a universal de primer die. The resizing die that comes with a Lee die set also accomplishes this, but the brass must be cleaned first. By using the universal decapping die, I also ease my burden. I don't have to individualy clean the primer pockets. The brass cleaning process does that for me. The “tumbler” is what I use to clean my deprimed brass. In goes the tarnished blackened brass, and out comes shiny clean brass. Two popular types of polishing media are corn cob and walnut. I use corn cob as this is what was reccomended to me by my local retailer. In addition to the media a polishing compound is also going to be needed. DO NOT USE BRASSO it contains ammonia and ammonia will work to dissolve the copper that is in the brass. Your local retailer will have a suitable compound. Next time, I'll talk about resizing and priming cases. Corn cob: available in the pet section in walmart as guinea pig bedding. Polish: Simple Green works wonders and leaves your brass smelling minty-fresh. 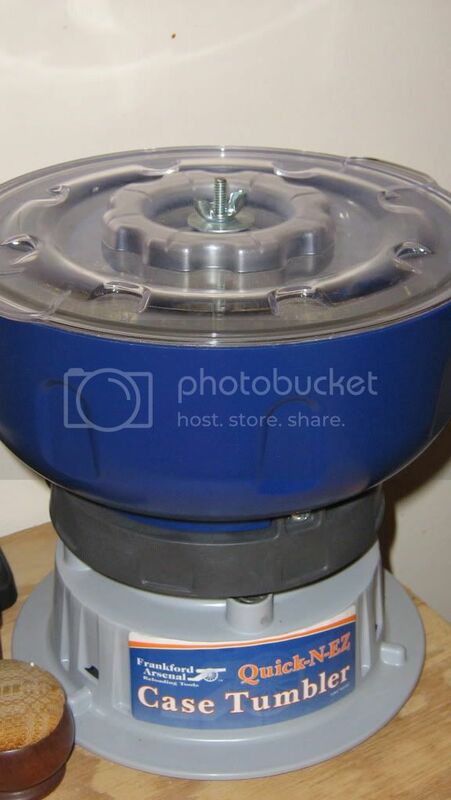 I've got my press, scale, dies, powder measure, etc. I've read ABC's cover to cover twice. 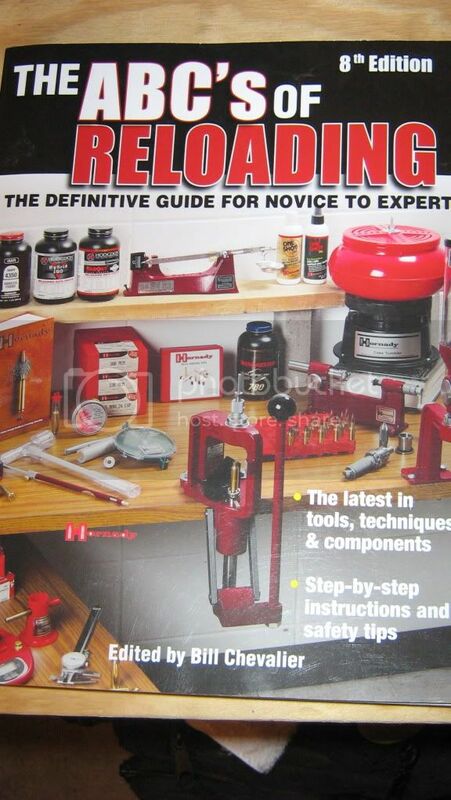 I suppose I need to get a current reloading manual or two and get cracking!